Five-year-old Ridhul and two-year-old Siddharth haven’t been informed of the death of their mother Lini yet. They know that their mother has to work in nightshifts. Hence they are not making a fuss about it, but it’s only a matter of time. Everyone is dreading to face the questions these children are going to raise and has no idea how they can be consoled. This is the situation at Lini’s home, the nurse who lost her life after attending to two Nipah infected patients. 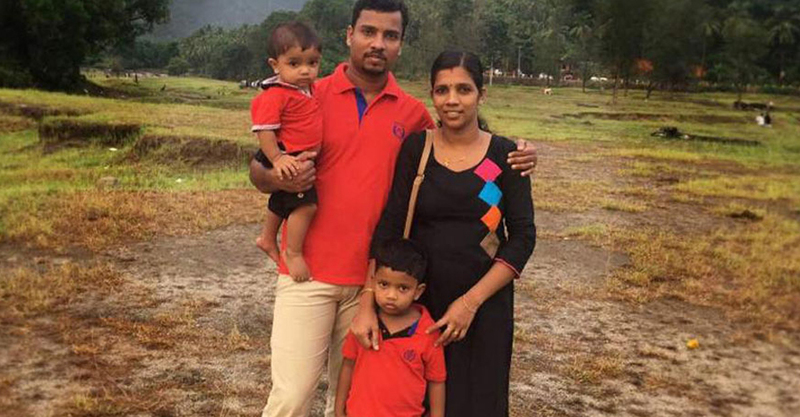 It was on Sunday that Lini succumbed to the deadly Nipah viral fever. Everyone around Lini remembers her as a compassionate soul whose life was dedicated to taking care of patients. Lini decided to become nurse after her father, even after chronic treatments and hospital visits, died years back leaving three daughters behind. Finding general nursing is not enough, she had done her BSc nursing degree from Bengaluru Pavan School of Nursing. She had paid back the education loan taken for this recently. Earlier she had tried working at MIMS hospital in Kozhikode. But couldn’t repay the loan with that. Her family had approached the government to write off the loan, but no one helped. With no other options, she took the daily wages job under NRHM scheme at the Perambra Taluk Hospital. Lini was the daughter of Chembanada Korathippara Puthussery Nanu and Radha. She was married to Vadakara native Sajeesh who works as accountant in Bahrain. Sajeesh arrived from Bahrain after knowing about Lini’s condition, but was instructed not to see her as there are chances the virus might spread. Lini was cremated at the West Hill electric crematorium.